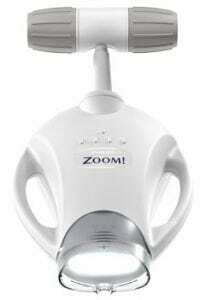 Northshore Dental and Oral Health on the Sunshine Coast Offer Philips ZOOM! Teeth Whitening and Poladay Whitening. These whitening treatments can last anywhere from one to two years, depending on your oral health and hygiene. We use Philips ZOOM! Teeth Whitening for our in-chair teeth whitening solution, and our Poladay Whitening for patients to whiten their teeth in the comfort of their home. What is Philips ZOOM! Teeth Whitening? Teeth whitening is the most common cosmetic dental procedure performed at Northshore Dental and Oral Health. ZOOM! Teeth Whitening is a clinically proven tooth whitening system that is safe and effective to remove stains and discolouration. This procedure has grown in popularity for being a fast way patients can achieve whiter teeth. ZOOM! uses a powerful hydrogen peroxide whitening gel which is applied to the teeth. This whitening gel is activated through light penetration to reach deep within the tooth enamel. This gel remains on the teeth for a time frame of 15 minutes. This process is repeated 3 times or until desired results are achieved. While undergoing ZOOM! teeth whitening a protective gel is used to cover the patient’s gums to prevent contact with the whitening gel. After the treatment is complete Northshore Dental at times will recommend a tooth moose which will assist to minimise the sensitivity in your teeth. This is ideal for all patients including those who are time poor and looking for a quick yet effective way to brighten their pearly whites. What is Poladay take home whitening? The take home teeth whitening kit Northshore Dental and Oral Health offer our patients is Poladay Whitening. Poladay and Polanight both contain mineral fluoride, which occurs naturally within all water sources. Fluoride is used to remineralise your teeth to provide protection from tooth sensitivity. Poladay take home-kit is a thick gel which will stay contained in the trays for a non-leakage treatment. This is also effectively achieved due to the custom fitted trays created for each patient. Poladay is an advanced neutral pH teeth whitening formulation that assists patients to achieve their teeth whitening goals in as little as 30 minutes a day. Quick – ZOOM and Poladay teeth whitening are both quick yet effective treatments. They can produce results up to 8 shades brighter within a short period of time. Patients can choose either in-office whitening or the comfort of your own home. Comfortable – Many over the counter whitening treatments cause a patient to experience pain and sensitivity of the teeth while using these products. This is usually the cause from incorrectly sized trays or strips which result in the hydrogen ions making contact with a person’s lips or gums. Effective – When a patient visits a dentist for teeth whitening they receive an initial oral check-up and clean. This is to confirm teeth whitening is the ideal solution. Some staining is internal and cannot be treated with teeth whitening treatments and requires further dental procedures to achieve desired results. Northshore Dental and Oral Health clinic will assess each patient’s individual needs, and their desired results to provide a tailored treatment plan. However, some deep staining and discolouration of the teeth cannot be whitened by teeth whitening. Your dentist may recommend our same day crown system or veneers to instantly enhance the brightness of your teeth. Please contact our professional team for more information or to book a consultation for a whitening assessment. What’s the difference between over-the-counter teeth whitening and professional teeth whitening? An over-the-counter tooth whitening kit cannot produce the same efficient treatment to determine the best options as each patient is individual and requires tailored care. Professionally whitening your teeth can help to encourage patients to present their best smile the world. Patients find their new-found smile helps them to perform in everyday life situations after having their teeth whitened. To see if you’re a candidate for our safe and effective professional teeth whitening treatments, contact Northshore Dental and Oral Health today. Worried about cost? Don’t be. For all our services we offer a range of payment plans including zipMoney MediPlan, GE Finance and also an in-house payment plan. We also accept most major credit cards like MasterCard and Visa. And have also recently implemented a HICAPS machine, so you can get your rebate back quickly, and easily.